Hi everyone. 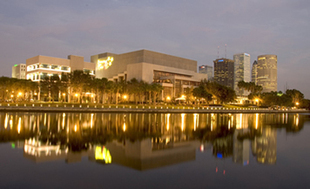 Travis here with some more exciting news about arts and culture in Tampa Bay. Nearly 200 serious student ballet dancers from around the country and England will begin a five-week summer intensive at the Patel Conservatory today! This five-week Next Generation Ballet at the Patel Conservatory/Straz Center for the Performing Arts summer intensive follows a two-week junior summer intensive, in which 99 students from around the Tampa Bay area participated. Dancers are coming from England, as well as New York, Texas, Missouri, Minnesota, Connecticut, Wisconsin and several other states to study ballet with some of the country’s finest dance instructors and to perform with professional ballet dancers from Boston Ballet and Trey McIntyre Project. And the attendees get to do a lot more than just dance! Students generally will study ballet Mondays through Saturdays, with Sundays reserved for fun-filled excursions such as trips to the beach, Busch Gardens, Islands of Adventure, Disneyworld, Adventure Island and the Broadway show Mama Mia at the Straz Center. Next Generation Ballet at the Patel Conservatory/Straz Center for the Performing Arts recently was awarded the distinction of “Outstanding School” at the world’s largest student ballet competition, the international Youth America Grand Prix in New York City. On Friday, July 29, at 7 p.m. in Ferguson Hall, students from the intensive program will perform Summer Fantasy with guest artists Lia Cirio and Jeffrey Cirio from Boston Ballet and Dylan G-Bowley from Trey McIntyre Project. The program will display classical ballet standard pieces alongside cutting-edge contemporary work. This exciting showcase will feature some of the finest emerging talent in the nation alongside leading American dancers. Regularly priced tickets to Summer Fantasy start at $15 and may be purchased by calling 813.229.STAR or 800.955.1045 outside Tampa Bay, in person at the Straz Center Ticket Office or online at www.strazcenter.org. There is going to be some great Tampa Bay Entertainment, so take advantage now! And keep checking back here for more great things to do in Tampa Bay.